For England, Moeen Ali, Ben Stokes and James Anderson scalped two wickets each. Half-centuries by debutant Hanuma Vihari (56) and Ravindra Jadeja (86) helped India post 292 runs in their first innings against England on the third day of the fifth and final Test at the Oval here on Sunday. Jadeja’s 156-ball knock brought the visitors back in contest as India were once reeling at 160/6. Jadeja was involved in a 77-run partnership with Vihari before stitching 32 runs with tailender Jasprit Bumrah (0). The visitors now trail England by 40 runs. Earlier, resuming the third day at 174/6, Vihari and Jadeja played sensibly to get close to England’s 332. Vihari also notched up his maiden Test half-century before edging a Moeen Ali delivery to England wicket-keeper Jonny Bairstow. India lost the wicket of Ishant Sharma (4) and Bumrah in the post-lunch session. While Ishant’s thick edge went into Bairstow’s gloves, Bumrah was run out, the last wicket to fall. 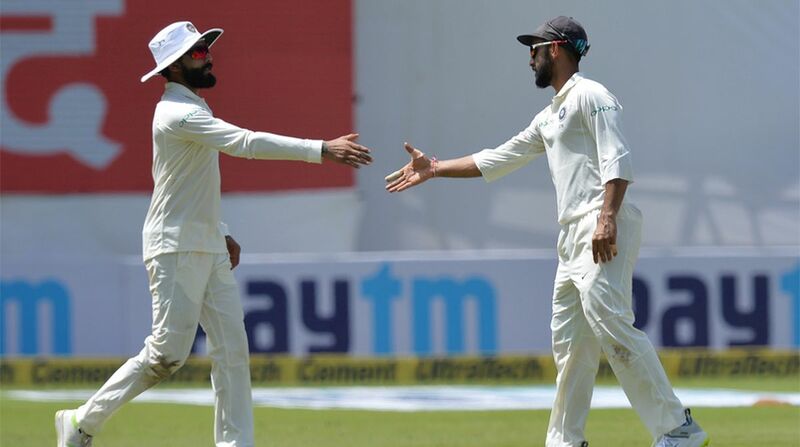 Brief scores: India 292 all out (Ravindra Jadeja 86, Hanuma Vihari 56; James Anderson 2/30) vs England 332 (Jos Buttler 89, Alastair Cook 71; Ravindra Jadeja 4/79, Ishant Sharma 3/62) on Day 3.